The first day after the conclusion of the NHL regular season is always a rough one for coaches of teams that didn’t qualify for postseason contention. While some are able to keep their position and work towards improving in the future, there are often those who don’t get that same courtesy and who find themselves promptly out of a job. This was true for both Bob Boughner of the Florida Panthers and Phil Housley of the Buffalo Sabres who were fired Sunday just one day after the 2018-19 regular season ended. 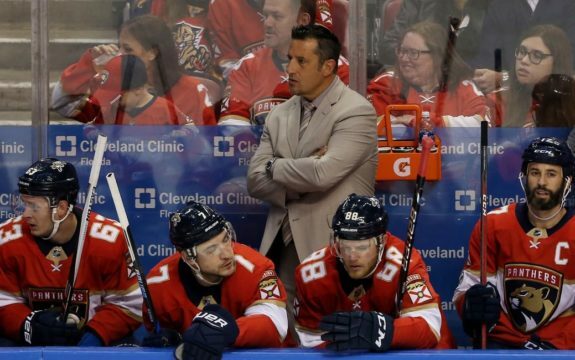 The Panthers would fire Boughner as well as assistant coach Paul McFarland. Dale Tallon, the team’s president of hockey operations and general manager, would release a statement on this decision through the Panthers’ official website. We made a tough decision today and have relieved Bob Boughner of his duties as head coach. We didn’t meet expectations this season and share responsibility for that fact. After careful evaluation, we have determined that this is a necessary first step for our young team and we will seek to identify a transformative, experienced head coach with Stanley Cup pedigree to lead our team going forward. We’re grateful to Bob, Paul and their families for their hard work and their dedication to the Panthers organization and we wish them the best of luck in their future endeavors. This decision came after two seasons of failed playoff bids for Boughner in Florida. To his credit, the team would miss the postseason with 96 points in his first season with the team in 2017-18. While 96 points may not be enough to qualify for the postseason in the Eastern Conference this season or last season, it would have been more than enough in the Western Conference. This season alone the Dallas Stars and Colorado Avalanche both qualified for the playoffs while only recording 93 and 90 points respectively. Still, the Panthers would take a step back this season and would only earn 86 points. The Panthers have reportedly wasted no time in trying to find their replacement for Boughner either and have contact Joel Quenneville to man the bench in Florida. This would be appropriate given Quenneville’s history with Tallon from their time with the Chicago Blackhawks. The Sabres would also join the Panthers in firing a second-year head coach as they would relieve Housley of his duties after two missed playoff bids. This may seem like an unfair situation for Housley given the fact that the Sabres are still looking to complete their rebuild and may be a few pieces away from doing so. At the same time, Housley’s management of the roster in terms of lineup decisions and decisions in-game caused many a headache in Buffalo this season. For the Sabres, the next step forward is to find an adequate coaching replacement who can get the best out of the roster put in front of them by general manager Jason Botterill. In his time coaching the Sabres, Housley would lead the team to a 58-84-22 record over two seasons. The team is looking for much more and while the playoffs may not have been the expectation, continued growth is certainly something the team would like to see each and every season.